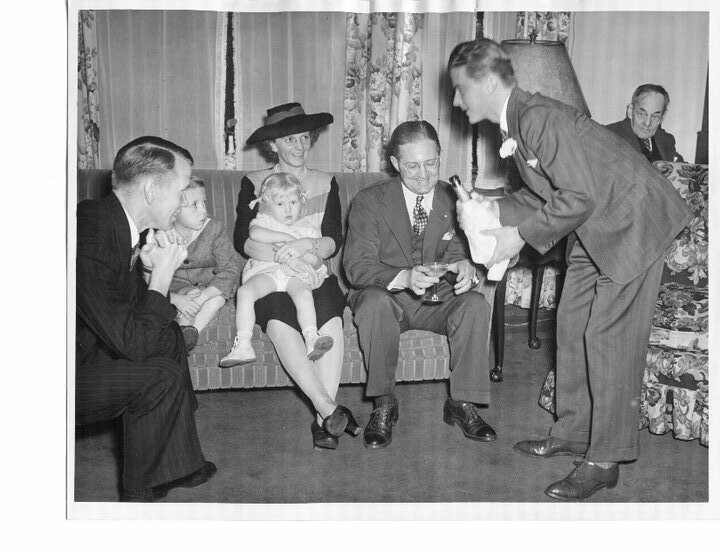 My parent's wedding reception, 29 Dec 1946. Aunt Ada with the hat and her husband and my cousins. 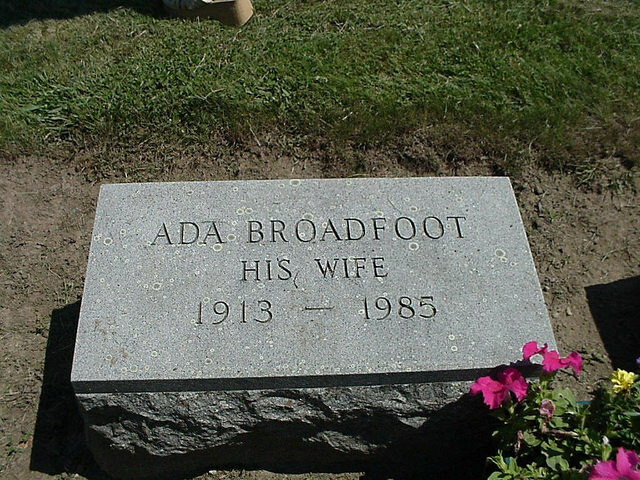 My paternal aunt, Ada Broadfoot, wife of George Curry, and the mother of the only two first cousins that I have is buried at River Bend Cemetery, in Westerly, Washington, Rhode Island. She was a widow when she died and her headstone is next to her husband. My father or my mother, always forgot to tell me that someone was sick or had died. Despite my status as family historian, it didn't seem important to include me and I find it embarrassing. All of them came to my father's funeral and graveside burial. It was a comfort. As a small child on Memorial Day, there was a visit to this cemetery and I often went because, in those days, Westerly was a long car ride from Cranston. Now we have interstate 95 and a connecting road called the Westerly by-pass to get to this beautiful cemetery. I liked my dad's family but I didn't see them often. 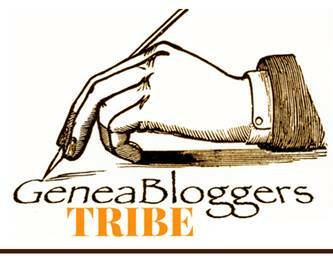 All of my father's generation is gone now. I took this photo the day we buried my mother. I took my camera to the cemetery because I wasn't sure I could find the section without some photographs. This day was the day, I decided to start photographing family gravestones. As you can see, there is only a year or birth and year of death on the headstone. My husband asked why her name was written with her maiden name and he was surprised when I answered that this is the correct way. My mother chose not to follow this rule which is odd because at the end of her life, she told people her name was Dorothy Stewart not Dorothy Broadfoot. Dementia can wind the clock backwards unexpectedly. Because I interviewed the members of my paternal family when I was about eighteen (hand drawing my own family group sheets), I have Aunt Ada's name, date and place of birth and marriage date and place in her own handwriting. Later, her sister told me Ada's middle name was Langworthy. I can find no evidence of this except for the initial L. in a few census records. 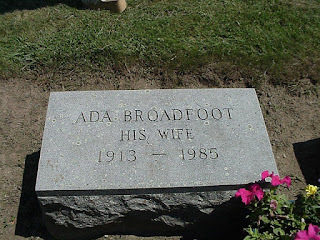 I knew Ada died as a widow in November 1985 from the Social Security database. Her date of death is not included on the cemetery plot card. I was glad to see that she is buried near her parents because I now know she was the daughter that took care of them and my father and his brother for many years. A week or so ago, I searched the Google news archive hoping to find some obituaries that I didn't have. The local paper was and still is, The Westerly Sun but it is not included in the collection. However, the New London Connecticut newspaper called The Day, (still in publication) is and because of the proximity to Westerly, Rhode Island I was hoping to find some information without having to bother my retired cousins. I was very surprised to learn that my Aunt was so sick that she died at the Rhode Island Hospital. I wasn't sure where she lived after Uncle George died. I have learned that when her mother, who was my grandmother died, Ada was the one who took care of my dad and my uncle as well as her father. That can't have been easy. She soon married and stayed in the house with her husband and my cousins as they were born. My Dad went to serve in WWII and when he returned, lived with his other sister in Providence where there was more work. Uncle Bill married Hannah in 1951 and they moved to her house. Ada finally had her own life. This is a very nice tribute to your aunt. Your family was lucky to have her in their lives.